OK, so is it wrong of me to be thinking about Christmas in August? I don't think so ... all of the former Holiday collections are all going on sale at all my favorite retailers... and I can't wait until Basic Grey's Jovial Collection comes out. So this is a plea to all my local scrapbook store owners ... please bring in BG Jovial collection pack - I want to buy it! Here's a sample of the yummy goodness it has in store! Here is another sneak peak at the wedding album that I am doing for my friend Angela. Nearly finished now, I think I have three pages left to do, and maybe some titles etc. I used Basic Grey's Capella line for this layout. I made my own lollipop flower out of black satin and some beads. I used a toggle clasp from the fabric store and some ribbon. Dollar store bling and flowers. I made my own corsage pin with some beads and a pearl-topped pin. What is hard to see in this photo is the fact that there is lace at the top, behind the tear above the Bride's head. The lighting today just isn't working with me for this layout, sorry about that folks! 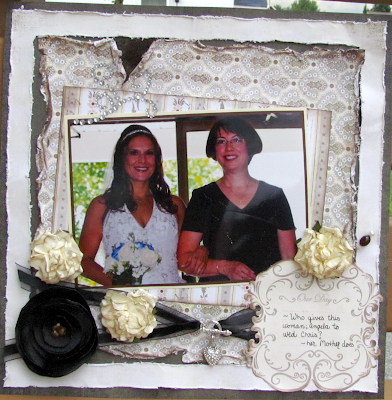 This is another layout that I am doing for my friend Angela's wedding album. I'm going to reveal the whole album in the next week or so, but here is one more sneak peak. 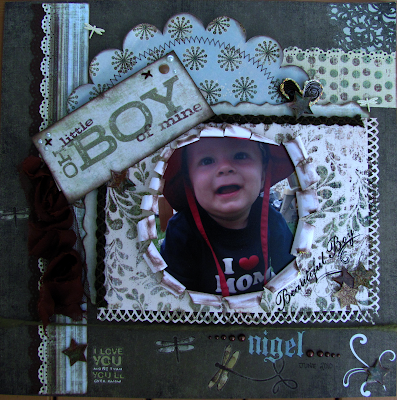 I borrowed alot of the ideas for this layout from a fellow scrapbooker Robinzberdz layout called "it's a beautiful DAY"
I used Basic Grey's Capella line. Prima flowers as well as Webster's Pages Bloomers. The swirly bits in the corner I did on the Cricut with the Storybook cartridge. Dollar store bling and metal title plaque . A Bo Bunny brad and alot of distressing! FIRST CONTEST - Planning a Boy's First Birthday Party! So, I'm starting the planning process for my son's first birthday party.... and I'm looking for YOUR ideas! 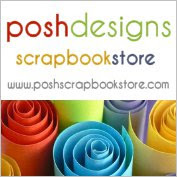 Share with me your ideas, I will pick one of the idea entries as a winner and send that person a beautiful set of 6 greeting cards handmade by ME! 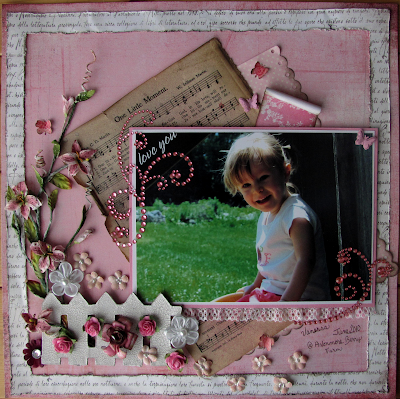 Simply leave me a comment on my blog with your ideas, you can even email me photos if you wish. Be creative, lets see what you can do! 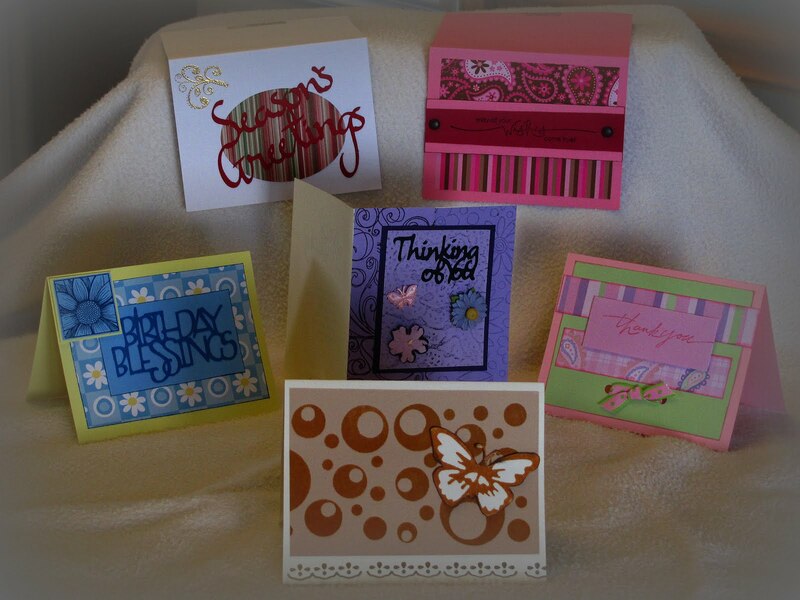 The card set will include: one pink & green Thank You card, purple dry embossed Sympathy card, blue & yellow Birthday card, one Season's Greeting card, blank Butterfly card, and a very lovely pink & brown "may all your wishes come true" that can be used for birthday or any other event. 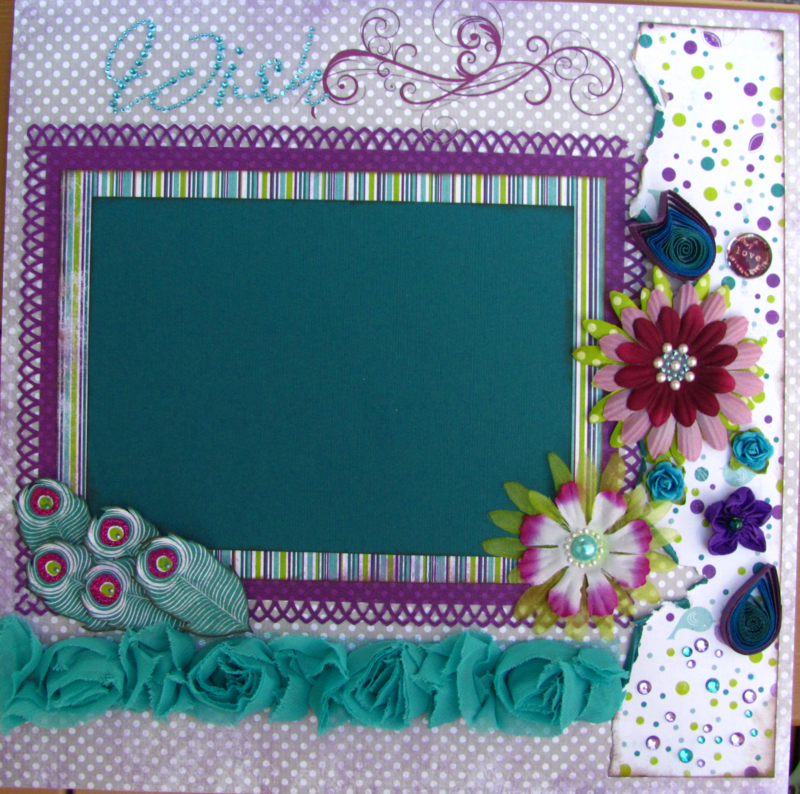 Using more of my My Mind's Eye - Laundry Line kit that I picked up from Craftysteals.com I love it all! So many great rub-ons and chip pieces! I used a technique that I have seen a few times whereby the photo is "busting through" the page with curled edges. I'm not sure I really like how this turned out, but I'll go with it for now, and I will try it again for sure. 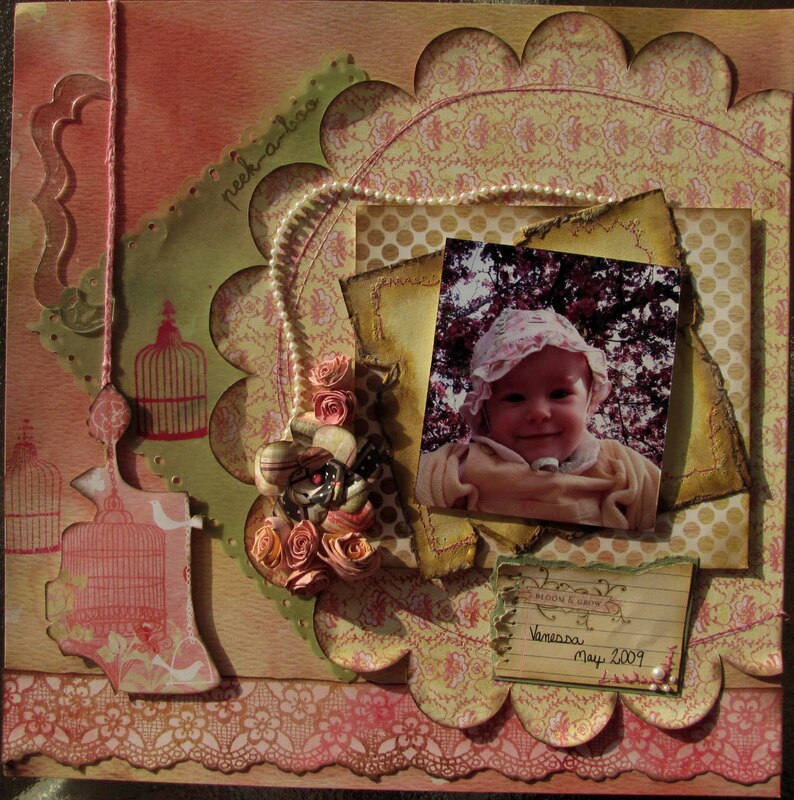 I used my Martha Stewart punches, and some of those awesome Bloomers from Webster's Pages. I used my quilling tool again for the heart. I did some over embossing on the stars. (I feel a tutorial in order for the over embossing - it's really quite easy) Lots of rub-ons and some bling and done! Enjoy and tell me what you think of it! As promised, here are two of my layouts done with the Peacock Lane line from Bo Bunny. 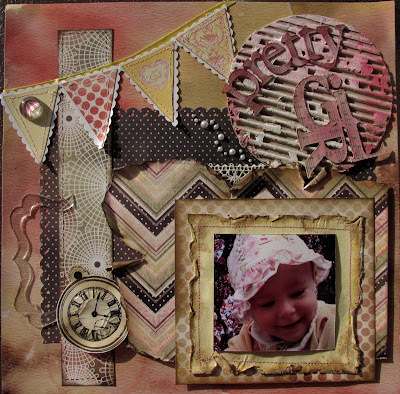 Loving every little scrap of it! I'm still looking for some great photos to put in it. I had a friend supply me with some wonderful photos of Peacocks, however I can't seem to get the quality to my liking enough to print. For the first one, the only thing that isn't Bo Bunny that I added was a little row of purple pom-pom's and some Stickles on the feathers and purple dots! 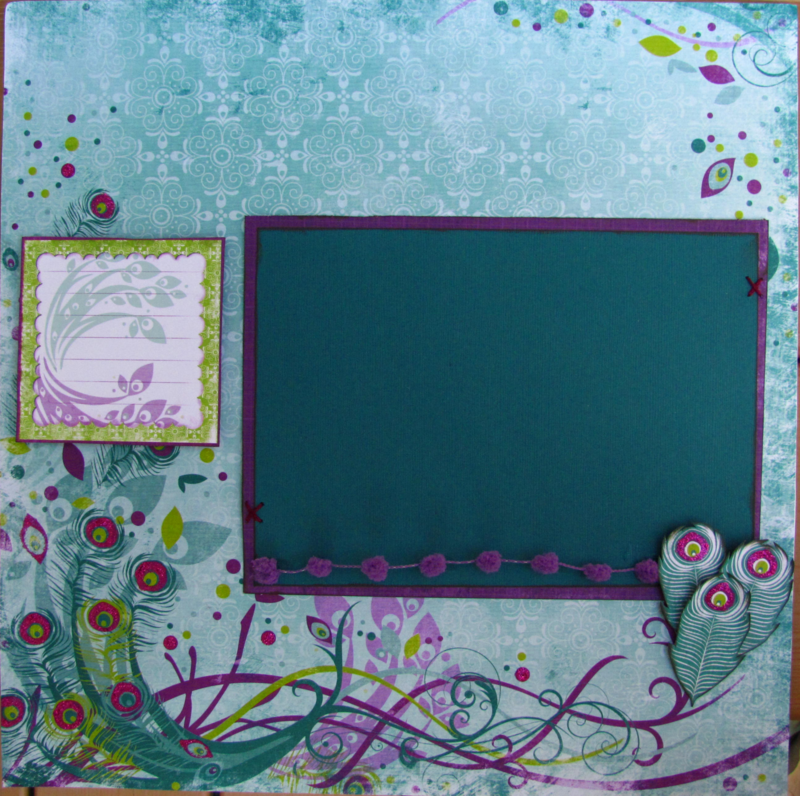 For this one, I used my paper quiller to mimic the design in the feathers. I used some Petaloo flowers and Prima's Say It In Pearls centres. A Prima pebble. Webster's Pages Bloomers across the bottom (love them, can't get enough of them - can't wait for the new ones to be available) I used some bling for the title "wish" and over some of the dots in the bottom corner. Again Stickles on the feathers and my new Martha Stewart punch for the border. Just to add some photos and all is complete! I finally got my hands on some Bo Bunny's Peacock Lane. I've good big plans for these papers. A good friend is going to give me some photos of peacocks from her trip to England - so looking forward to that! 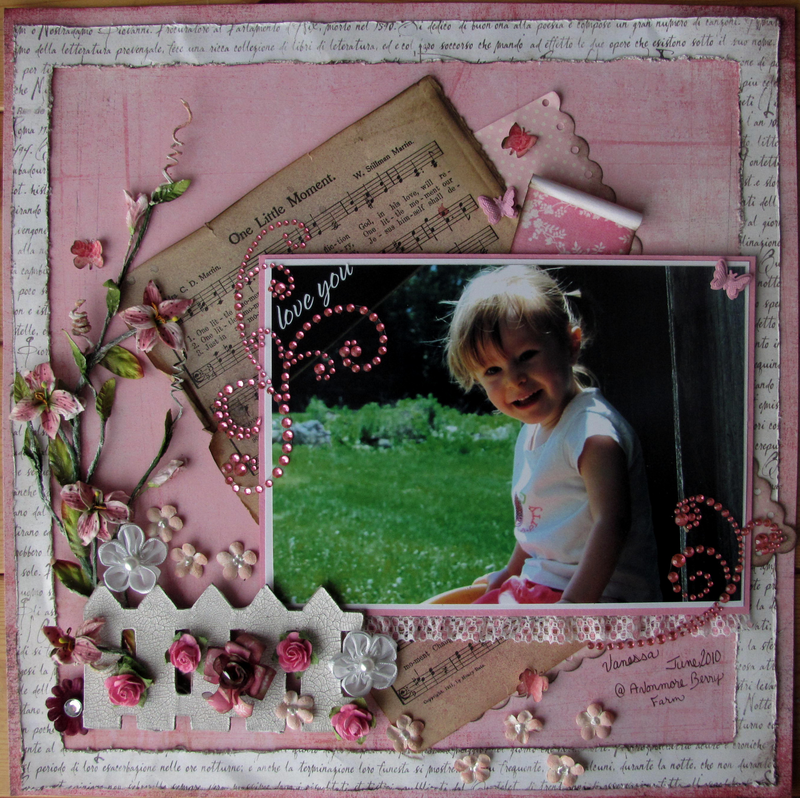 I've not been scrapbooking too much, I was away for the last week and a half on a whirlwind visit to my parent's place and visiting some old friends from the area. Scrapbooking tomorrow night though, and looking forward to it, get my creative juices flowing again. I fell in love with this photo of my daughter, it looks so natural and not posed. She was playing on a slide at a local park and I snapped it from behind as she turned to go down the slide. Perfect! The picket fence I cut with my Cricut using the Pot Pourri cartridge - loving that one, it's one of my favorites right now. 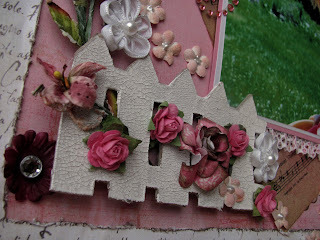 I painted it with Tim Holtz crackle paint in (oddly enough) picket fence! I also crackle painted the little five petaled flowers in - tattered rose, and put a dob of liquid pearl in the middle of each of them. I used a page out of the vintage Hymn book for the title, I thought it was appropriate; didn't have to antique it up too much, that paper is pretty fragile as it is! The little roses, stargazer lily vine, and bling are all Prima. I had a cheap butterfly punch that I used for the little paper butterflies. 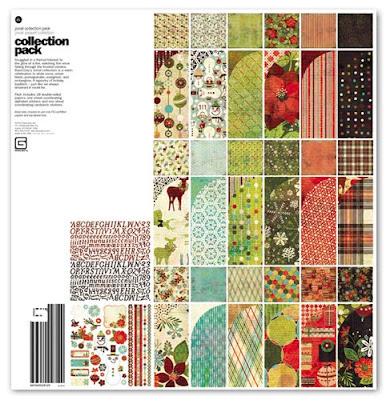 The background paper is Basic Grey - Bittersweet collection. The frame is Basic Grey as well - The Basics collection. The larger rose peaking out of the fence I made with the same technique I revealed on my blog the other day - here is a link. I hope you enjoy this one, as I said it is one of my favorites... Loving the fence and the Prima vine bloomers! One of the most asked questions I get is how to make a flower without having a die cut machine like a Cricut or Sizzix etc. Well here is the tutorial for you! Fold each square in half (corner to corner) into a triangle. Cut between two of the petals down to the centre - once on each flower. Glue the underside of petal on the left of the cut section to the top of the petal to the right of the cut section. Repeat this for the largest four flowers. For the smallest of the flowers, cut one petal out, and glue the petals to the left and right of the gap together. Stack your flowers on top of each other; gluing between layers. Ensure that you stagger your petals for a fuller effect. Fluff the flower and YOUR DONE! For more effect you can add a button to the centre or beads. You can also glue glitter to the petals. Let me know what you think! Show me your results! I had some terrific photos on my husband's cell phone camera of my daughter in a yellow dress and sweater against a blossoming cherry tree. However the resolution on his cell phone is pretty poor, so I knew I had to keep the photos small. I think it turned out quite well. I used Basic Grey's Porcelain line. I tried my hand at paper quilling some flowers - they turned out great and I will definitely do that again. I'll post a tutorial soon on paper quilling; once I perfect the art. I made the large flower as well. I thought the string of pearls lent well with these papers. I used a stamp from Technique Tuesday for the pocket watch and used Tim Holtz Crackle Accents to create the broken face to it. A Prima pebble, and some Say It In Pearls along with some clear Bo Bunny Chunky Charms. 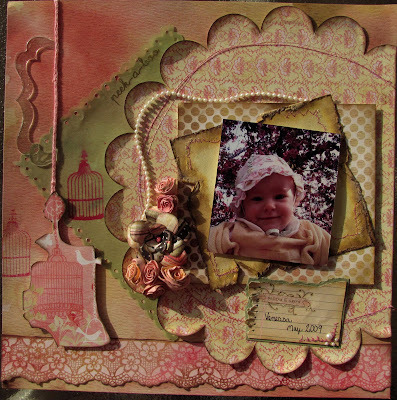 I stitched alot on this layout, little bits here and there, around the photos and on the scalloped circle and on the banner pieces. 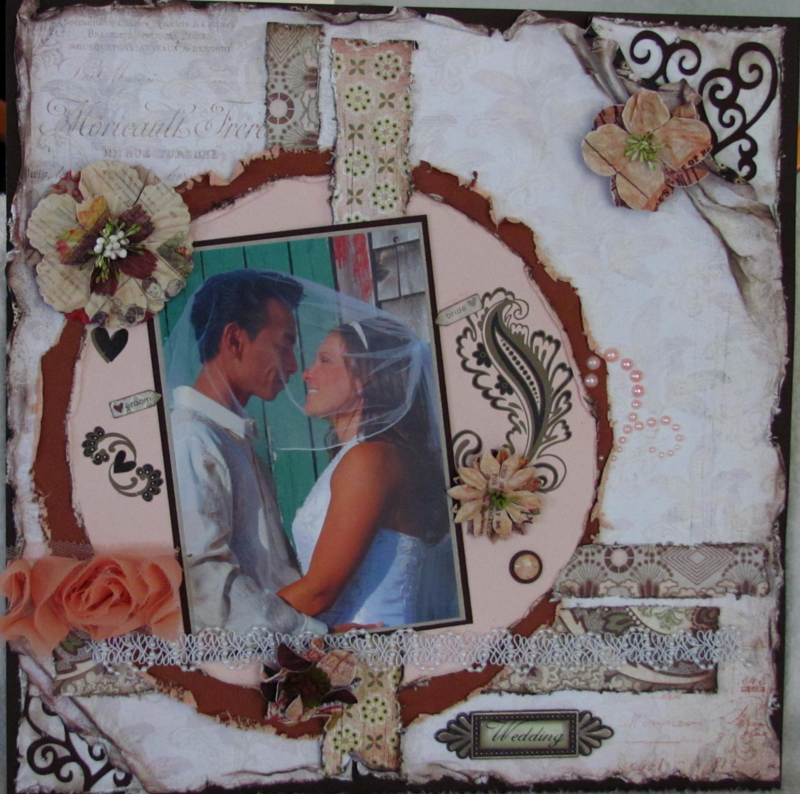 I used some Basic Grey rub-ons from the Sugared collection. 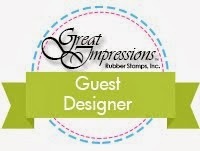 Let me know what you think :o) Become a follower!